McLaren has introduced an updated 12C GT3. The new model will be available to compete in the 2013 season with a revised aerodynamics package, an upgraded ECU with a revised electrical system and alternative dampers. This changes are designed to offer enhanced drivability, reliability and efficiency, coupled with reduced complexity. The car is powered by a 3.8-liter V8 twin turbo McLaren M838T engine that is connected to a six-speed sequential transmission. It comes with McLaren Electronics ECU interfacing with Bosch ABS and Shiftec transmission control units. 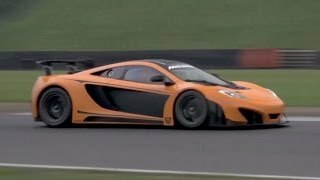 The enhanced 2013 McLaren 12C GT3 costs £325,000(£389,780 / $518,930), and is eligible for all FIA GT3-based race series.